Native English speaker who hosts Altaic Storytelling and specializes in translating ethnic-themed Chinese fiction into English. Newly created posts include translated excerpts from Guo Xuebo's novel Moŋgoliya and Alat Asem's novel Confessions of a Jade Lord, and a bilingual "mini-database" of African literature in Chinese translation 非洲文学：中文译本. 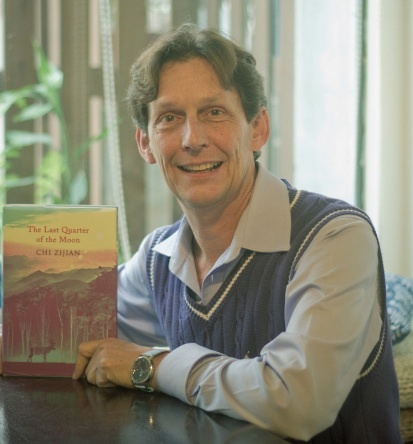 My published book-length, Chinese-to-English translations: The Last Quarter of the Moon (额尔古纳河右岸，迟子建著), by Chi Zijian; Shanghai Baby (上海宝贝，卫慧著), by Wei Hui; Chinese Dress & Adornment through the Ages (中国历代服饰艺术，高春明著) by Gao Chunming; and two co-translations: The Most Beautiful Chinese Classical Paintings (最美的中国古典绘画); and The China Tea Book (中国茶书). New Twist for Campaign to Take Chinese Literature Global? I also learned that in Finland there are 2.2 million saunas. They have carried this widespread sauna culture to the book fair. Reading sessions are being held in public saunas in Frankfurt. A Finnish author could bust into any sauna . . .
Chinese Books Go Global: M & A Coming Soon to Your Home Country? When you have trouble moving product overseas -- and cash in your pocket -- you can always call on a classic strategy: take control of the distribution channels. There are four traditional ways to do so: set up your own local firm; invest in a local firm; merge your firm with a local firm; or simply acquire an existing player in that market which owns a respected brand name. Is China getting ready to do so in the publishing field, as part of its soft power push? Winners of the "2013 China International Translation Contest," co-hosted by the State Council Information Office, Chinese Writer Association and the China International Publishing Group, have been announced. According to 国际翻译大赛, the organizing committee provided 30 pieces of contemporary Chinese short stories from which to choose, and 1,006 renditions were received from over 30 countries in English, French, Spanish, Russian and Arabic. I recently made a number of suggestions on concrete steps that could help ensure greater success for the “campaign to take Chinese literature global.” They are detailed in Open Letter to China Literary Exports, Inc..
中华读书报 (China Reading Weekly) interviewed me about my proposal, including the establishment of a Translator-in-Residence program. If you'd like to read the interview (in Chinese), and see the part of the draft text that was deleted just before publication, visit 建议：建立 ‘驻地翻译基金’，积极征募外国翻译家到中国短期居住. In the just-published The Unbearable Dreamworld of Champa the Driver, author Chan Koonchung takes us on a rocky road from Lhasa to Beijing. Along the way he paints disturbing vignettes. An apartheid-in-the-making. The eerie death wish of a would-be self-immolator. The Kafkaesque “black jails” where provincial petitioners who dare air their grievances to the Beijing Mandarins are brutalized, then sent home.
" . . . 781 Japanese novels were translated and published in South Korea in 2012," according to Takayuki Iwasaki in Japan's Literati Impervious to Politics. On October 31, Professor Tai Zaixi will speak on (Self) Censorship and the Translator-Author Relationship: The Case of Full Translations, Partial Translations, and Non-translations in the Chinese Context at HK Baptist U's Centre for Translation. In Nobel Win, Ho Ai Li of Singapore’s Straits Times notes that Mo Yan’s Nobel Prize—regardless of how his own writing is perceived abroad—is helping to spark interest in translated Chinese fiction. Since most of us won’t be able to get beyond the pay wall, I’ve selected three choice quotes from the article below. But pls resist the temptation to re-tweet Eric’s words on your Weibo account, as we’d hate to see his visa renewal application denied next time round . . . The new version is due for release in November, just before the 120th anniversary of Mao's birth. Its chief editor, Chen Yu – a senior colonel at the Academy of Military Science – describes it as a voluntary initiative. "We just want to edit the book, as other scholars work on the Analects of Confucius… We don't have a complicated political purpose," said Chen. Sounds innocent enough . . .
Murakami Haruki’s latest novel, his first major release since the 1Q84 trilogy in April 2010, goes on sale in Japan April 12. I haven’t found any hint of its name in English, but according to a report by Shi Chenlu at Chinanews.com (村上春树新长篇) , its (temporary) Chinese title is <没有色彩的多崎造和他的巡礼之年>. Intriguingly, now the hunt is on for the Chinese translator. You may recall that the monopoly of long-time Murakami translator Lin Shaohua (林少华) ended abruptly when the contract for rendering What I Talk about When I Talk about Running was handed over to Shi Xiaowei (当我谈跑步时我谈些什么，施小炜译). It's true that the Western media, and not a few China hands, would like nothing better than for Mo Yan to have delivered a Nobel acceptance speech that criticizes China's censorship practices. One could argue that this is a selfish if not downright childish desire. on Turkey's Daily Sabah Reviews Uighur Tale, "Confessions of a Jade Lord"
on Real-life Sequel to "Last Quarter of the Moon"